Visitors whisper in the Cathedral Grove. After a few days of hectic activity in San Francisco, we slipped across the bay and made our way to Muir Woods, a place I’d always wanted to see. It was a Monday, and although it was a holiday (Columbus Day, or, as it is known in Berkeley, Indigenous Peoples Day), we imagined we might have the place to ourselves. Silly tourists. We got our first inkling that we weren’t the only ones looking to worship giant trees as we neared the park entrance. “Lot Full” read the sign at the first parking area. A park ranger was waving cars toward the overflow lot. Another “Lot Full” sign met us there. But an additional sign offered hope in the form of an arrow pointing to “Roadside Parking” up ahead. We headed down the narrow roadway, made narrower by the steady stream of people hiking back to the park, presumably from the roadside parking. We soldiered on, bright with hope. After a mile or so we began to doubt. But there were still determined groups tramping in the dust at the road’s edge. Eventually we found a narrow spot and parked. Then we joined the hikers. The day was warm and sunny, the air dry and dusty. We had neglected to bring water. Silly tourists. As we trudged along, I told myself it would be worth it, but I wasn’t completely convinced. So often much-hyped splendors don’t quite measure up to the imagined experience. Plus, I worried that the presence of all these people we had seen pouring into the park would destroy the serenity I sought. Too big for any camera. 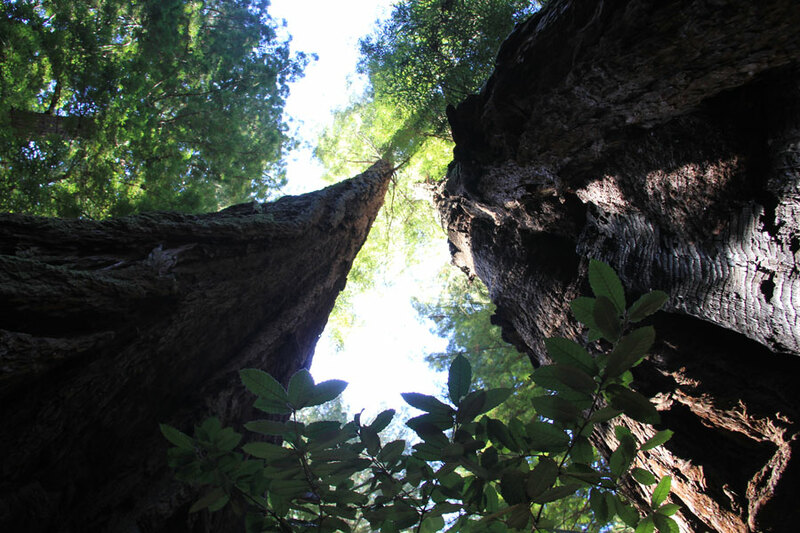 The trees in Muir Woods tower high, wide, and mighty above the trickle of puny humans down on the forest floor. 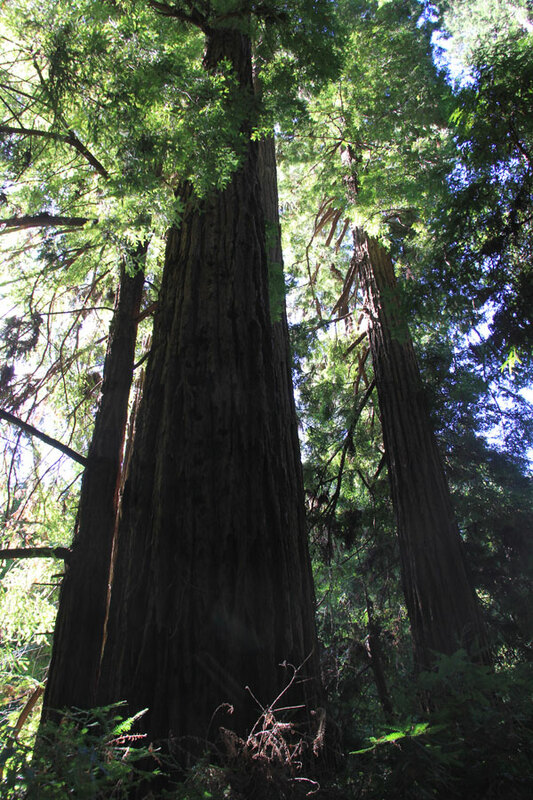 These ancient redwoods, many of which were old before Columbus stepped foot on the shore of the other side of the country, stand over 200 feet tall. Visitors, self-included, try in vain to capture the sheer magnificence of these redwoods with cameras, cell phones and other devices. It can’t be done. They are simply too big to be caught with our gadgets and toys. They transcend our limited grasp of time and space. They awe, in the truest sense of that word. Look up. Look higher. Good luck with that. All forests have the capacity to restore the human spirit, to revive our hopes and replenish our souls. 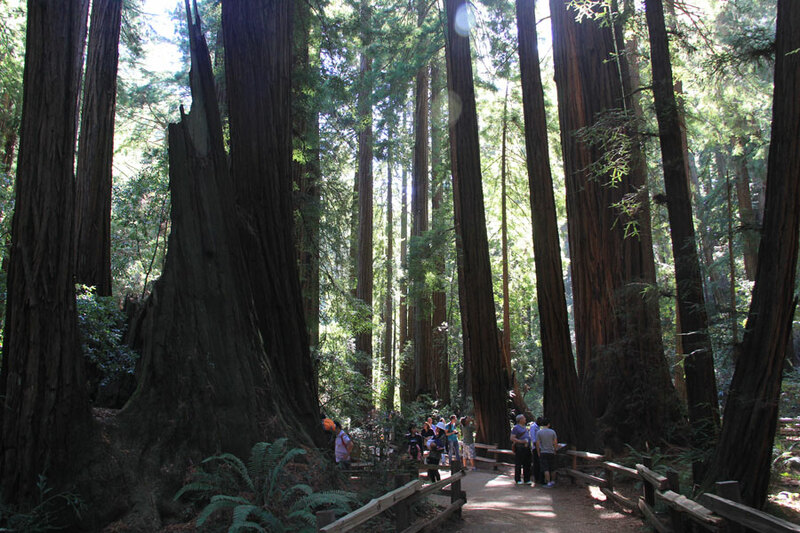 But Muir Woods does more. In the stillness of its shadows, in the soft fall of light between the massive trunks, it inspires reverence for the glory of creation. And I say amen to that. Hey, I CAN make comments! Um, love this! You are the one who told me long ago that the Celts worshipped trees. That’s when I decided to be a Celt, and am grateful to you whenever I worship. Love you.